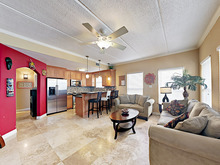 This chic 1BR has everything you need for a great stay on South Padre Island. With modern decor and trendy tile throughout, this condo in the Falcon House complex is just 600’ from the beach and within easy walking distance of the area’s many restaurants and nightlife destinations. LIVING AREAS After a fun-filled day in the surf, return home and unwind in the inviting living area. A plush sofa and matching love seat provide the perfect spot to curl up and watch a movie on the 50” TV with cable. KITCHEN & DINING Whip up home-cooked meals in the modern kitchen, outfitted with stainless steel appliances, granite countertops, and a stylish tile backsplash. When it’s time to eat, perch at the kitchen bar with seating for three or dine at the table with seating for two. SLEEPING SPACE This home sleeps up to four people in a bedroom and a pair of built-in twin-over-twin bunk beds in the hall. Find quiet privacy in the bedroom, furnished with a king-size bed and a 36” TV. The bathroom is equipped with a walk-in shower and comes stocked with a complimentary starter supply of toiletries and bath amenities, as well as plenty of plush towels. OUTDOOR AREAS Enjoy morning coffee on the balcony, which offers seating for two. Early risers will be treated to an excellent sunrise over the Gulf. A shared grilling area provides a charcoal grill, seating, and a grassy area perfect for kids and pets to stretch their legs. EXTRA AMENITIES & DETAILS Guest amenities at this dog-friendly condo include complimentary Wi-Fi, a washer/dryer, and reserved parking for one vehicle. This third-floor unit (on the top floor) is accessed via stairs, and therefore may not be suitable to those with limited mobility. This property is registered with the City of South Padre Island Permit No. 2016-044357. THE LOCATION A prime location less than a block from the beach makes it easy to go back and forth during the day. The bay side of the island is a short, 8-minute walk away. You’re also surrounded by delicious restaurants, surf shops, and nightlife destinations. With the Island Market or Blue Marlin Supermarket each just a 2-minute drive away, keeping the kitchen stocked is a breeze. Many other South Padre attractions are within a short drive, including Schlitterbahn Resort (9 minutes), South Padre Island Birding & Nature Center (5 minutes), Sea Turtle Inc. (4 minutes), and Gravity Park (4 minutes).